CLEVELAND (AP) — Michael Crabtree sat dejectedly in front of his locker and knew exactly who to blame for Baltimore’s loss. “Put that on me,” the Ravens receiver said. Crabtree’s drop wasn’t the only issue for the Ravens (3-2), who couldn’t get anything going on offense and then had their defense fail them in the closing minutes of OT. But for all their problems, the Ravens might have pulled out another AFC North win if Crabtree had squeezed Flacco’s throw with a minute left. With the Ravens down 9-6 and facing a third-and-10 at Cleveland’s 14-yard line, Flacco fired his pass over the middle toward a leaping Crabtree in the back of the end zone. Crabtree got both hands on the ball, but it bounced off him and instead of taking the lead, the Ravens settled for Justin Tucker’s 32-yard field goal with 56 seconds remaining. It wasn’t an easy catch, but it’s one Crabtree has made countless times. He had two other drops earlier in the game. “You gotta finish,” said Crabtree, who signed with Baltimore in the offseason after three years in Oakland. “I’ve been there and done that, and this go-around I can’t even jump. I gotta get back in the lab and work on my concentration. That’s all it is. It’s football. You gotta see the ball and catch the ball. 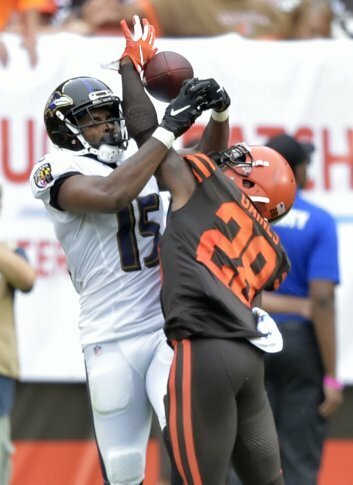 It was one of those days for the Ravens, who failed to take advantage of good field position in the first half, and allowed Browns rookie Denzel Ward to come off the edge and block Tucker’s field-goal try on the final play of the first half. Flacco completed 29 of 56 passes for 298 yards and threw a costly interception in the first half when the Ravens were driving for another score. On second-and-goal at Cleveland’s 2, Flacco’s pass intended for tight end Nick Boyle was deflected by defensive end Emmanuel Ogbah and picked off by Ward. It was just Flacco’s third pick this season, but it felt ominous on a day when neither offense could get into a rhythm. As poorly as they played, the Ravens may have gotten a bad break in overtime. On Baltimore’s first possession in OT, running back Alex Collins ran for 17 yards but receiver Chris Moore was called for an illegal block, moving the ball back and out of range for Tucker, the most accurate kicker in league history, to try a long field goal. The Ravens lost for just the third time in 22 games to the Browns, who improved to 2-0-1 at home and 1-0-1 in the division. Baltimore’s defense did its part — the Ravens still haven’t given up a second-half touchdown — but couldn’t stop rookie quarterback Baker Mayfield in overtime. The Browns were backed up near their end zone, but Baltimore let Mayfield scramble for 13 yards and then gave up a 39-yard pass play to rookie Derrick Willies, who got open over the middle. “We have to execute regardless of what the situation may be,” safety Tony Jefferson said. “We have to execute the call, and we didn’t in that particular situation. We didn’t finish. We’ve been trying. We’ve been doing a good job at that, so far this season. Today we fell short of doing that, but we have a good opportunity coming up against Tennessee.